Powers/Abilities: As She-Venom, Ann Weying possessed superhuman strength and durability, sharp claws and teeth, and the ability to shoot webs from her wrists, turn invisible and negate Spider-Man's spider-sense. She could also extrude tendrils from her symbiote. Weying is a competent lawyer, and swings a mean pipe. History: (Venom: Dark Origin#1) - Undergraduate ESU student Ann Weying met Eddie Brock when he pulled another student off a payphone; when the situation threatened to become violent, Ann separated the two. Brock claimed to need help finding his apartment off-campus, and ended up taking the two of them to a bad neighborhood. He admitted that he lived on-campus, and had lied to her to spend some time with her, just as they were attacked by a gang of thugs. Ann hit her head, and didn't see Eddie trying to flee without her and Spider-Man beating up the thugs. When she came to, Eddie claimed that he had beaten them up. (Amazing Spider-Man#375 (fb) ) - Ann eventually succumbed to Eddie's boyish charms, and they were married. He delighted in taking her to amusement parks; his favorite was Brooklyn's Thrill World. (Venom: Dark Origin#2) - Ann was delighted to see Eddie become a star reporter when he wrote a series of exclusive articles for the Daily Globe about the serial killer Sin-Eater. However, she became concerned as his job consumed more and more of his time. (Amazing Spider-Man#375 (fb)/Venom: Dark Origin#3) - With Brock's "Sin-Eater" exposed as a copycat, Brock became psychologically unstable, obsessively talking about Spider-Man and lifting weights; saddened by the loss of the man she'd known, Ann served him with divorce papers and changed her name back to Ann Weying. He kept avoiding her, however, until he bonded with an alien symbiote. Shortly after their union, she met him outside his apartment, where he signed the divorce papers in ink formed from his "other". (Amazing Spider-Man#375) - Spider-Man, his "parents" (actually synthetic imposters created by Harry Osborn) kidnapped by Venom, sought out Ann Weying. Finding her in her penthouse apartment, Ann told him about her past with Brock. She mentioned that his favorite amusement park was "Thrill World", inspiring the wall-crawler to search for Brock there. She followed him in a taxi, unaware that she was being followed by the Wild Pack's Raul Quentino, who had been assigned to capture Venom. She found Eddie there, and was startled by his appearance. 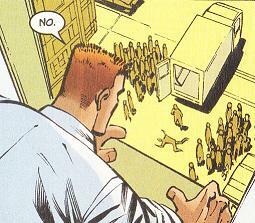 She suggested that he release the "Parkers", but before Venom could respond he was blasted by the Wild Pack. As they battled, the park caught fire; Brock rescued the "Parkers" and handed them over to Ann. She gave them to Daily Bugle photographer Lance Bannon, then saved Eddie from Quintana by hitting him with a pipe. Just then, the park's Ferris wheel collapsed, falling towards Ann; Brock, his symbiote weakened by Quintana, was unable to lift it by himself, so Spider-Man helped him toss it aside. Venom then turned on Spider-Man, but Ann persuaded him to cut a deal with the web-slinger instead. (Venom: Sinner Takes All#2/1) - The Sin-Eater fired at Ann, but Brock's symbiote intercepted the blast. The Sin-Eater killed the lights and escaped, and Brock fled the hospital with Ann, taking her to his subterranean hideout. Her painkillers began wearing off, and her wounds opened back up, prompting Brock to share his symbiote with her; she was initially horrified, but soon found it soothing as it healed her. She drifted off to sleep, but her pulse weakened; Brock ordered his symbiote to bond with her fully. It did so in the form of a shroud, until two criminals, Big Brown and Junior, burst into the hideout and took out Eddie. Awoken by the violence, Ann arose in a new symbiotic form to battle the invaders. (Venom: Sinner Takes All#3/1) - Ann attacked the two predators; realizing that the symbiote was influencing her mind, Brock tried to calm her down, but she shoved him away and slaughtered them. The symbiote flowed back onto Brock, leaving Ann horrified by what she'd done under its influence. Ann fled into the streets, and left with a passing police car. She stopped at her apartment before she could be taken to a safe house, only for her to be held at a woman who thought her daughter, Kirstin, had been victimized by Venom. (Venom: Sinner Takes All#4/1) - Kirstin's mother watched news reports on the Venom/Sin-Eater battle with Ann bound and gagged on the floor. (Venom: Sinner Takes All#5/1) - Brock came back to the apartment, but Kirstin's mother gunned him down. Not recognizing him, she left him under a sheet, waiting for Venom to return. He transferred his symbiote to Ann, who freed herself and attacked the madwoman, only to be attacked by the Sin-Eater. Kirstin's mother blasted the Sin-Eater, then moved to shoot the revived Brock, only for the symbiote to jump back to him. While he stopped the Sin-Eater, Ann clobbered Kirstin's mom with a lamp. (Rune vs. Venom#1) - After hearing news reports blaming Venom for a series of murders, Ann had a nightmare about transforming into Venom and killing Eddie. Upon awaking, she was abducted by the symbiote-possessed extradimensional vampire Rune, whose symbiotic other wished to punish Venom for defeating the symbiote invasion of Earth. While he explained his motivation to her in his warehouse base, where he had constructed a stargate, Venom tracker her down and attacked Rune. Rune tore off his symbiote and consumed it; its power allowed him to overwhelm Venom, but Ann hit him with a pipe, allowing Venom time to recover and knock Rune into the stargate, sending him back to his native Ultraverse. Brock took Ann home and swore to always protect her. (Venom: Along Came a Spider#1/1) - The NYPD's Venom Task Force took Ann into custody in the hopes of luring Venom out into the open. Brock called her apartment to check in on her, and the call was transferred to police HQ. Brock sensed that something was amiss, prompting him to convert his symbiote into a molecular monofilament and travel through the phone line. It briefly melded with her again, putting her in a rapturous state as she shared minds with Brock. She broke the call, but Brock had learned where she was, and broke into the police station and rescued her. When they reached the roof, Ann refused to go any farther; Brock objected, and Spider-Man (Ben Reilly) arrived, drawing Brock's attention. (Venom: Along Came a Spider#2/1) - While Spider-Man and Venom battled, Ann hit Reilly in the head with a pipe, telling him that Eddie had only wanted to help her. The police chased Brock off with an air raid siren, then arrested Ann. She used her phone call to call Brock to make him promise that he wouldn't try to rescue her again, but instead he again sent his other through the phone lines, which fully merged with her this time. Reporter Trish Tilby was on the scene, and dubbed the creature "She-Venom". (Venom: Along Came a Spider#3/1) - She-Venom plunged out the station window and fled across the city to Thrill World, where she planned to meet Eddie. In the House of Horrors, she inadvertently stumbled upon arms and drug dealer L.D. 50 and his gang. She attacked them, while Spider-Man (who had followed her) tried to save them from each other. Brock arrived on the scene just in time to be set on fire by Roach, one of L.D. 50's men. (Venom: Along Came a Spider#4/1) - Ann transferred the symbiote back to Brock, allowing it to heal his burns. Roach took Ann as a hostage, but Clark of the Venom Task Force shot him before he could kill her. Venom and Spider-Man burst in to save her, but she rejected Brock, telling him that he had become addicted to the symbiote, and that she didn't want to become addicted herself. She warned him to stay away from her until he got rid of it and ended his vendetta against Spider-Man. (Amazing Spider-Man II#19) - Traumatized by her bond with the symbiote, Ann became an agoraphobic recluse, unable to leave her apartment. Months later, Brock came to visit her; he told her that he'd changed, but she ordered him to leave. He opened the window to let some light in, only to see Spider-Man (Peter Parker) swinging by in his black costume (his red-and-blues having been stolen). She mistook it for the symbiote, and recoiled in horror. Brock promised to handle him, and transformed into Venom, but Ann could feel it reaching out to her, wishing to bond with her again. As Brock left to battle Spider-Man, Ann ended her torment by leaping out the window to her death. Brock returned to find her lifeless body on the sidewalk below, and blamed Spider-Man for her death. (Amazing Spider-Man II#22) - Brock visited Ann's grave in Calvary Cemetery in Queens, where he swore to avenge her death by killing Spider-Man. While there, he was attacked and separated from his other by Senator Stewart Ward. Comments: Created by David Michelinie, Mark Bagley & Randy Emberlin. Man, Ann hits people with pipes a lot. Ann Weying was identified as "Anne" throughout ASM#375, but has been consistently referred to as "Ann" ever since. Weying's appearance was rather mousy in ASM#375, but she contracted a nasty case of Ashley Kafka Syndrome (read: became hot) between then and her next appearance in Venom: Sinner Takes All#1. 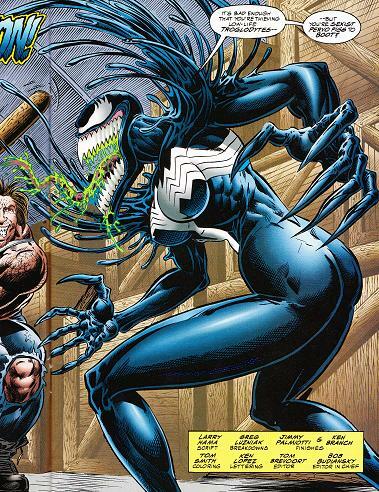 Of course, that's nothing compared to the "racelift" she underwent in Venom: Dark Origin, where she's depicted as African-American. This was acknowledged as an error, and is corrected in the Dark Origin trade paperback. Bit of a continuity problem with Uncanny Origins#7 - it depicts Ann and Eddie as divorced before the Sin-Eater story breaks, but in Dark Origin, they don't divorce until afterwards. Reading ASM#375, it certainly seems like the Brocks didn't divorce until afterwards, so I'm gonna rule that scene in UO#7 out-of-continuity. This isn't the first time Uncanny Origins muddied the continuity waters - see also the Jahrmarkt. Ann got an awkwardly-posed action figure in the 1997 Venom: Along Came a Spider line. It did not sell terribly well. Her sobriquet "Bride of Venom" never appeared in-story, but it was in the "next issue" box in Sinner Takes All#2, on the cover of Sinner Takes All#3, and was the name of her action figure, so I figure it's worth listing here. (Spider-Man: Venom's Wrath) - When terrorists kidnapped Joe Robertson, Joy Mercado was amongst the Bugle Staff asked by Jameson if she knew any info on his whereabouts. She was later sent to Midtown South by Jameson, and Ben Urich suggested she get a report on Robertson's car (found abandoned) and Anny Weying's apartment. 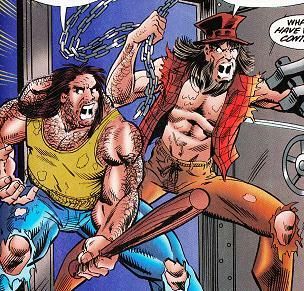 (Venom: Sinner Takes All#2) - Big Brown and Junior burst into Eddie Brock's subterranean hideout, looking to rob it. They easily handled Brock, but then found themselves facing down his ex-wife Ann Weying, who had just bonded with Brock's symbiote. (Venom: Sinner Takes All#3) - Undaunted, Big Brown and Junior attacked her, but they were no match for her symbiotic powers. Brock tried to stop Ann, but she tossed him aside and brutally murdered the two criminals. Big Brown is the guy with the hat and beard, Junior is the heavyset beardless guy.